The Login Function must be used on some (but not all) Control Modules before you can Recode or change Adaptation values. On others, it "enables" certain features like cruise control. Valid Login codes can be found in the Factory Repair Manual for your car. For certain immobilizer functions, you can select the largely obsolete [Use 7-digit PIN/SKC] button to enter a 7-digit Secret Key Code as explained on this page. 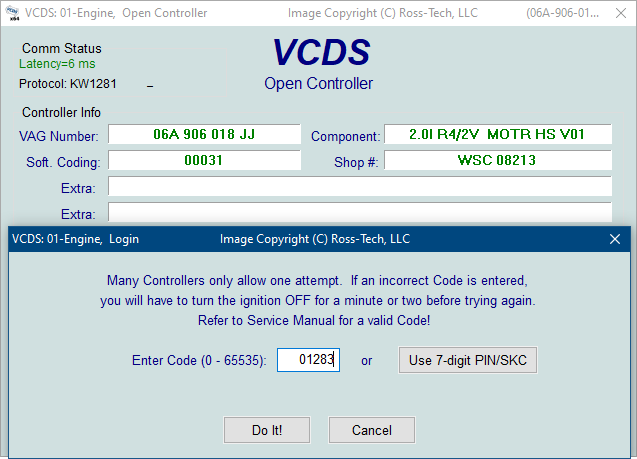 Balloons: VCDS can show Login "charts" when appropriate information is available in a Label File for the control module in question. The balloon will appear after a few seconds if the Label File contains the appropriate information. Use the [Do It!] button to save the Login and return to the Select Function Screen. Use the [Cancel] button to cancel the Login and return to the Select Function Screen. The following warning appears in the upper right corner of the screen if a session is disconnected after you have done a Login. You will need to exit the Controller do another Login. The most common cause of this is the use of an incorrect login code or a 7-digit PIN/SKC based on an incorrect Immobilizer ID or incorrect data entered in the 7-digit dialog.